Most garage doors are visible from the street, and make up a significant percentage of the façade that people can see as they pass by. You should be sure that such an important component of the exterior "envelope" is functioning properly and is well maintained. Such a large piece of your home's exterior is a pretty important consideration when you contemplate your priorities in maintaining and improving home value. 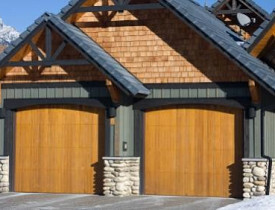 If you are looking for an area in your house that has improvement potential, the garage door is a good place to start. The basic maintenance for a garage door is pretty simple. You have to make sure that its paint, sealer, or factory finish is protecting it from the elements. You have to check the jamb and gaskets for wear or other problems, and you have to make sure that it's operating smoothly. If you have an operator, you have to replace the battery every once in a while. There have been a lot of developments in garage door technology recently, and a real focus on design improvements that make garage doors state-of-the-art building components. New garage doors have been developed with insulation values in mind that incorporate insulation systems and gasket improvements that can bring the R-value of a garage door up to 16 or more. That's higher than the insulation value of a fully insulated 2x4 exterior wall. Manufacturers have started to use vinyl-clad exteriors and new forming techniques to give a lot more design potential without adding too much weight. This revolution in garage door design mirrors the trend in builder-grade front doors towards mimicking high-end custom doors by using good design and new materials. However, it's when you get inside the garage door that things get interesting. The design of garage door openers has been steadily improving for a few decades. They work more smoothly and efficiently than they used to, and they are safer as well. Garage door safety is not a subject to be taken lightly - a garage door is quite heavy, and it's spring loaded under a high degree of tension. All new garage door openers have to be equipped with a kickback mechanism that will reverse the door operation if something is obstructing the motion of the door, plus an infrared control that will also reverse the operation if something obstructs the beam. Garage doors hung without openers have been equipped with safety cables that restrict the spring operation to prevent injuries. Additionally, recently the bottom rail brackets have been made tamper-proof. Finally, what's really interesting is that the lowly garage door operator has become one of the central control tools in the new home automation paradigm shift that is going on now. Many home automation companies have created software that synchs the electrical systems of the house with the garage door opener. The idea is, that you can activate any of your home's operating systems with your garage door opener, such as lighting, HVAC, hot water, appliances, and security when you are entering or exiting your house.